PCOS Weight Loss Recipes, Polycystic Ovary Syndrome weight loss recipes. Weight loss is the only way to reduce insulin resistance and maintain normal blood sugar levels. Weight gain is a symptom that many women face during PCOS. We have carefully handpicked recipes with minimal fat, which will help you lose weight. Some of our zero-oil recipes can be part of your regular breakfast, lunch or dinner. Any one dish a day can be oil-free, but you must balance this with other recipes that have a little oil. Eliminating oil completely can do more harm than good as it can cause many vitamin deficiencies. Try recipes like sprouted moong and methi chila recipe, cauliflower greens methi palak sabzi recipe or moong dal chilas recipe. 1. Keep an eye on the portion size and consume small meals, with a gap of 2-3 hours between each. This is better than consuming three large meals a day. 2. Stay hydrated by drinking at least 2 to 3 litres of water a day. Whenever you feel hungry, try drinking a glass of water, coconut water or a healthy drink. This will help you eat less than usual and will keep you hydrated. 3. Do not forget to couple a healthy diet with exercise. Aim for 30 minutes of exercise during the day, such as climbing up the stairs instead of taking the lift, brisk walking, yoga, skipping, swimming, etc. to improve chances of weight loss. 4. Replace unhealthy snacks with low glycemic index (GI) fruits such as orange, apples, pears, avocado and grapefruit. Have them whole, along with the fibre, which helps you keep full and also adds much-needed nutrients and antioxidants to your diet. 5. Avoid refined flour (maida). Include whole grain cereals and pulses such as jowar, Bajra, oats, nachni, quinoa, rajma, matki and black chana, which include a lot of fibre and ensure you stay full for a long time. This will also avoid sudden cravings. As an occasional treat, you can try the Mini Oats Bhakri Pizza. yes, that is valid as having dosas and idlis with rice will not speed up weight loss for PCOS. Avoid refined flour, sooji, rice in your options. Have the protein rich buckwheat dosa recipe which is perfect for vegetarians. The 4 flour dosa recipe gives a good combination of 4 healthy flours (jowar, bajra, whole wheat and ragi flour) with no rice used. Foor healthy idlis, try our sprouts and palak idli, oats idli and moong dal and spinach idli. Read which dosas and idlis are healthy as that will give you complete list of healthy Indian dosa and idli recipes. We want you to have rotis without the usage of plain flour or deep frying any puris. Switch to usage of whole wheat flour, bajra flour, jowar flour, ragi flour. These minor changes will lead to a healthier lifestyle. Opt for bajra cauliflower roti recipe, jowar bajra spring onion roti recipe, jowar bajra garlic roti recipe or jowar bajra besan thalipeeth recipe . If you like stuffings, then try jowar pyas ki roti recipe or jowar methi roti recipe which are all healthy. 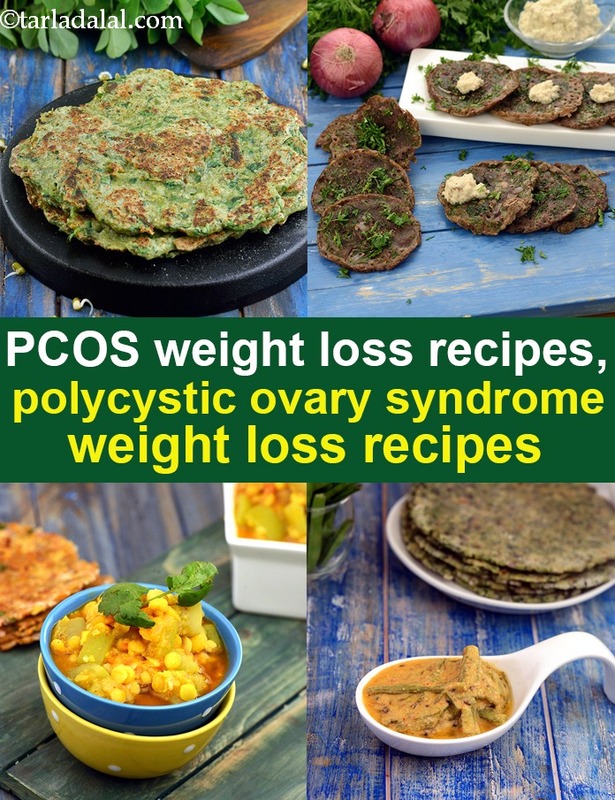 Enjoy our PCOS Weight Loss Recipes, Polycystic Ovary Syndrome weight loss recipes and other PCOS articles below.